Ray Feferman (right) and Mayor of Wachoch (left) in the town cemetery. You would never have known by looking at Ray Feferman that he was a very wealthy man. Or that he survived the cruelest of times in modern history. What would have been obvious was his love for the land and people of Israel. Ray passed away last year from cancer at the age of 86, but his legacy and love for Israel endures with the more than $2.5 million he donated to Jewish National Fund charitable gift annuities and the bequest left to JNF under his will. 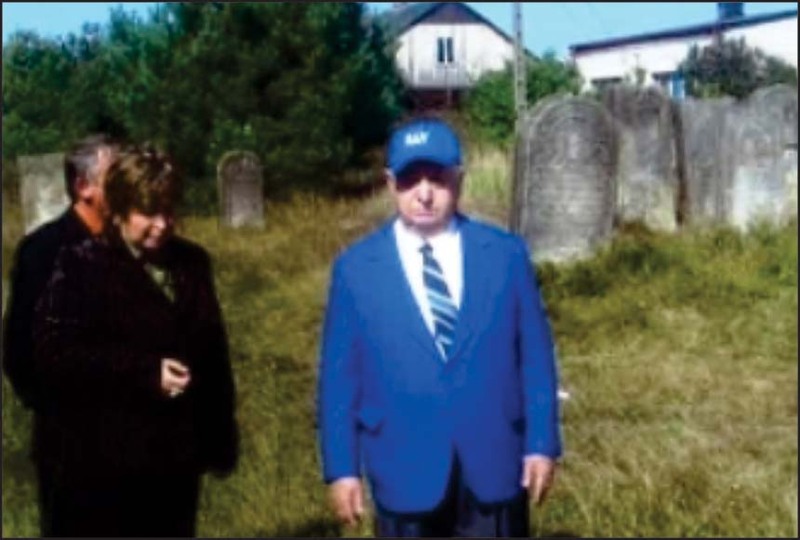 Born in 1927, in the small Polish village of Wachock to parents Shmuel Moshe and Basia Chana Feferman (Zelinger), Ray was the youngest of three children. According to Shirley Hackel, the daughter of Chaim Flancbaum, a childhood friend of Ray, ”The shtetl, like many others in Poland, had unpaved streets and wooden houses, and was home to ordinary, mostly pious people who lived simple lives. The Jews were shopkeepers, small business owners, bakers, shoemakers and tailors.” In fact, Ray’s parents owned the local grocery store. As a child, Ray was keenly interested in metal working and spent his free time watching the local tradesmen. That all changed when the Nazis came through his village in 1939 and promptly burned most of Wachock. As a 12-year-old boy, Ray saw things that no person, certainly a child, should ever witness. He saw villagers he knew rounded up and killed, helped carry the dead and their belongings to a mass grave, and saw many of the village’s Jews, including his own parents and sister, Leah, sent off in cattle cars to Treblinka to be murdered. Ray finally ended up with his brother, Ephraim, at the Starachowice labor camp. While both he and Ephraim had survived the camps at Auschwitz and Buchenwald, his brother later contracted typhus. One day, too ill to appear for work, Ephraim was led out to a mass grave and killed. After he was liberated by the US Army on April 23, 1945, Ray made initial plans to immigrate to the newly founded State of Israel and open a machinery shop there. Instead he came to the US and started a tool and die company, Rayco Manufacturing, in Astoria, Queens. Making precision parts for the electronics industry, Ray’s company attracted accounts that included Boeing and Lockheed. Always, in the back of his mind, Ray thought of the Jewish dead of his former town in Poland. He worked with the US Holocaust Museum to recreate a map and detailed history of the 98 Jewish families and household members chronicling who survived and perished (out of 459 only 24 survived). A generous advocate for Israel, Ray Feferman felt it his obligation to support the country that, “Talks for us, fought for us, makes us proud and equal to any nation.” Following his initial trip to Israel in 1972, Ray visited frequently. JNF was always a large focus of his philanthropy. Ray joined JNF’s prestigious World Chairman’s Council (donating more than one million dollars) and in Israel honored his siblings by establishing the Leah Brandel and Ephraim Pincus Feferman Woodland in the Martyrs Forest in Kesalon. He restored two acres of forest destroyed by fire and planted another woodland in memory of his parents. His family is also memorialized with a special pillar in American Independence Park. A bachelor all is life, Ray left no survivors at his death but many friends and charities remember his kindness. He was buried in Har Hamenuchot in Jerusalem. While Ray is no longer with us, his support for Israel lives on in the work that JNF does to make the country a safe haven and inspiring homeland for the Jewish people..
Rafael Feferman was passionate in his efforts to preserve history and memory. He leaves a legacy of hope for each of us. He also bequeathed to us the responsibility to continue to tell his story.